Mirvish + Gehry Toronto - 2 towers of 82 & 92 storeys! The Mirvish + Gehry Toronto is a long time project coming from theatre mogul David Mirvish in conjunction with Great Gulf developers and renowned architect Frank Gehry. Situated in the Art and Entertainment District on King Street West in Toronto, Ontario will encompass 2 residential condominium towers instead of the 3 as originally planned. After much debate, it was agreed between a city working group and Mirvish's group to develop and proceed with this massive downtown project. Mirvish + Gehry Toronto is a new mixed-use condo development project currently in pre-construction at King Street West and Simcoe Street and will definitely become an iconic landmark in Toronto! It will be preserving heritage buildings that will have a future positive significant impact on urban living. This development plan includes the preservation of the Princess of Wales theatre and includes space for art exhibitions and the OCAD University, formerly known as the Ontario College of Art and Design. Not only does this plan have 2 residential towers but will also include retail and commercial space consisting of two 6-storey (33.5 metres in height)stepped podiums. 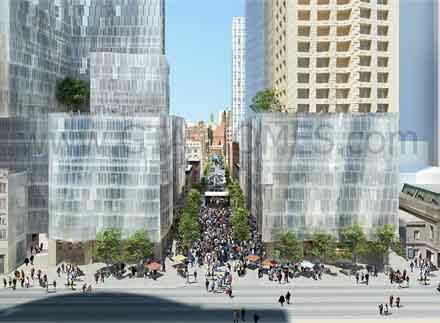 Two residential towers consisting of 92 (West side - 305 metres in height) and 82 (East side- 275 metres in height) storeys respectively with a proposed 1,949 dwelling units located on 260-322 King Street West between John Street and Simcoe Street in the heart of the Art District of Toronto. These towers are narrower than the original 3 towers proposed which therefore will cast smaller shadows making it more pedestrian friendly. The goal of the high-rise project"the focus on making the neighbourhood at King ad John St. a cultural corridor" and will be completed in phases. The proposal includes the 1,949 residential units as previously stated of which 215 will be bachelor units, 935 will be 1-bedroom units, 566 will be 2-bedroom units and 233 will be 3-bedroom units. There is going to be 9,957 square metres of retail space, 23,326 square metres of office space and 138,100 square metres of residential space. There will be a total of 670 proposed parking spaces in the 6 levels of underground parking with 8 loading docks on the premises. Register today for more information on the Mirvish + Gehry Toronto project! This video shows the original 3 tower plan; however, the approved project consists of 2 residential towers.